Maps could be printed out and students could work in groups assigned to compare different states' wind capacity. Areas with annual average wind speeds around 6.5 meters/second and greater, at an 80-m height, are generally considered to have a wind resource suitable for wind development. Using this and related state maps, students can determine where in the U.S. wind energy is a viable resource for electricity generation. Comments from expert scientist: The link provides access to wind resource maps for the continental US and some information on how they were created. Both the U.S. map and individual state maps can be printed. Can be used to discuss electricity transmission. 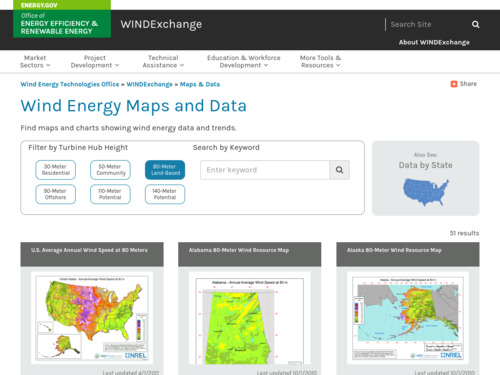 Students can see how different regions stack up in utilizing wind resources. Very easy to access maps and supporting materials in a variety of ways.